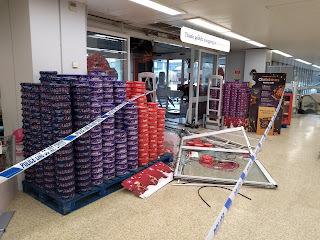 The suspects went to the supermarket at around 1.40 and reversed a white truck through the main doors. While they attempted to tie a rope around the safe in the Bureau de Change, they were unsuccessful and left empty-handed. Night-time staff were left shaken but unharmed.